We endeavor to provide consistently high quality service to all of our Customers. Our customers are delighted with the quick and streamlined procedure with claims being assessed on the same day. 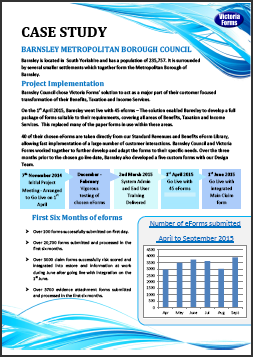 We are using the eForm to provide an assisted claims process which staff find simple to use. Our customers are pleased to have assistance completing the form and are especially pleased with the personal service they receive. One of the greatest benefits of the service is that eForms are completed without omissions, you don’t need to be able to read someone’s handwriting. In some cases we had to complete two or three paper forms for an application, this has been reduced to one online form. I have to say as project manager for this solution, it has quite possibly been the least complex software I have ever dealt with, the service is second to none and the support has been excellent. Introducing e-claiming has improved the quality of service our customers receive. We no longer experience processing delays due to late scanning and indexing or missing claims, as everything is accessible immediately. The Victoria Forms System is working well, and is used by our visiting team, reception and over the web. We encourage its use as much as possible. 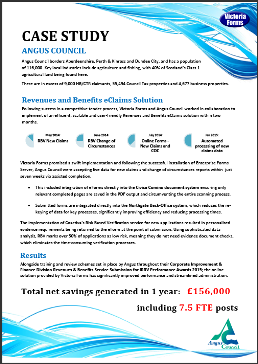 Victoria Forms and Angus Council worked in collaboration to plan the implementation of an efficient, scalable and user-friendly Revenues and Benefits eClaims solution within two months, leading to 64% quicker processing times than the UK average speed of HB processing. 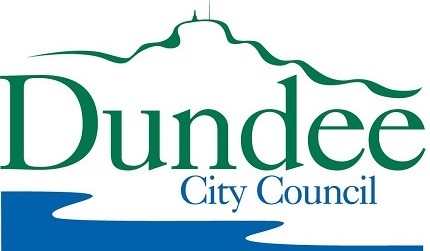 Victoria Forms promised a swift implementation and following the successful installation of Enterprise Forms Server, Angus Council were accepting live data for new claims and change of circumstances reports within six weeks via assisted completion. The proceeding two weeks saw the implementation of Coactiva’s Risk Based Verification service, resulting in personalised evidence requirements being returned to the eForm at the point of submission. Angus Council had been planning a corporate website upgrade prior to the procurement of Victoria Forms’ solution. Working with the Angus Council ICT department, Victoria Forms created a new eForm toolbar as part of the improved form customisation development, to match the new corporate website style. This work coincided with the launch of the new Angus Council website and Victoria Forms’ eForms going live to public users. Future plans: Full eClaim and eCIC integration into Northgate, Revenues eForm integration into Northgate, Risk Based Verification for Change in Circumstances. 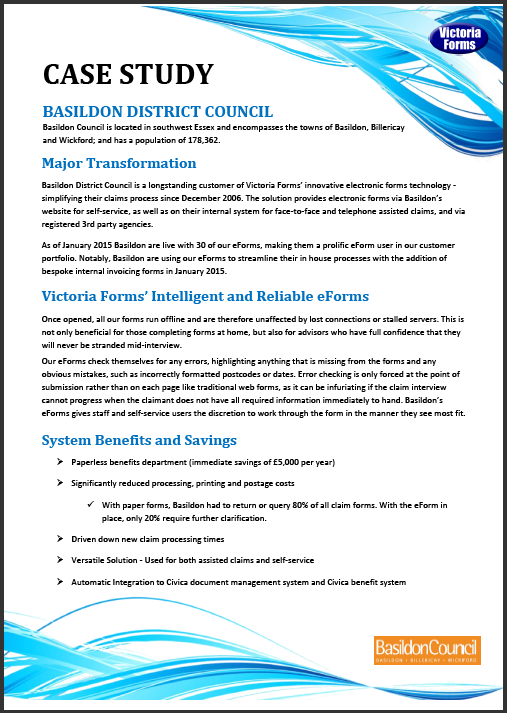 Ashford Council has been using Victoria Forms since 2012 to provide Benefits, Council Tax and Non-National Domestic Rates eForms for the majority of major processes involved within each. 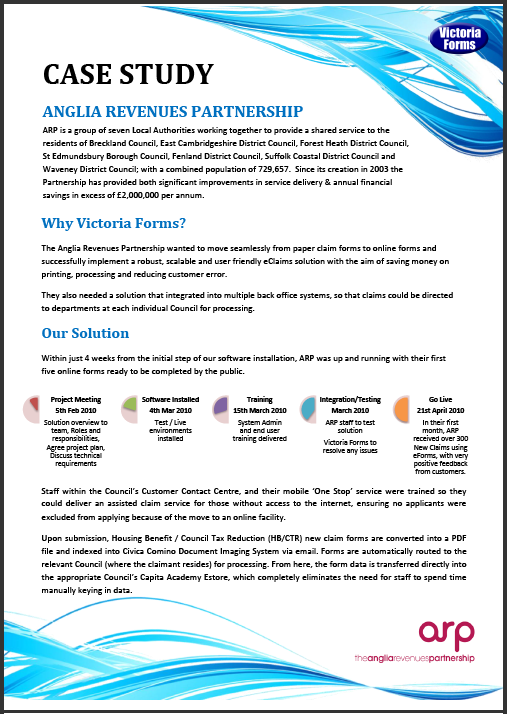 Ashford Council have access to the Victoria Forms eForms suite, enabling them to add any number of the 100+ pre-made Revenue and / or Benefit template forms if or when required. Victoria Forms has been working in collaboration with Ashford Council to advance the efficiency of utilised Revenues eForms via direct integration into Northgate, with our development work resulting in integrated Revenue processes for Change of Address, Direct Debit Instruction, Single Person Discount and Single Person Discount Cancellation eForms. Ashford Council are live with Revenues integration, and are testing Change in Circumstances Integration directly into Northgate iWorld Back Office. 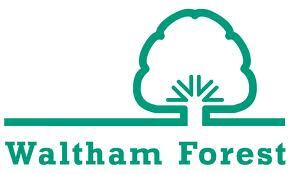 Waltham Forest has been using Victoria Forms’ innovative technology to simplify their eClaims process since December 2006. The electronic eForms are available via self-service, face-to-face and telephone assisted claims, and via registered 3rd party agencies. Advancements at gradual intervals have brought vast efficiencies to the benefits claims process, including over 90% of claims originating from the online form channel. 2012 saw the implementation of Free School Meals integration, which allows members of the public to complete an application and then be informed at the point of submission if they are eligible for Free School Meals. Customers who are confirmed to be eligible are able to print out a confirmation letter to take to the applicable school. 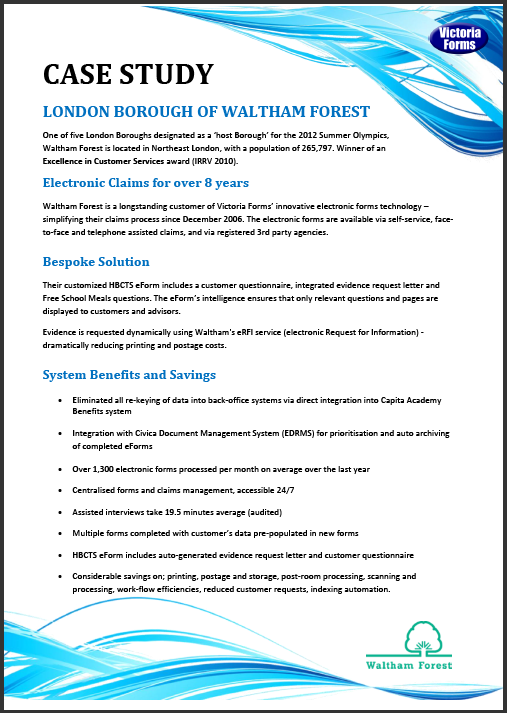 Victoria Forms is continually working with Waltham Forest to further develop the integration process of sending form data directly to Capita eStore. Waltham Forest went live with Change in Circumstances integration, alongside Coactiva’s Risked Based Verification for CIC in autumn 2014. 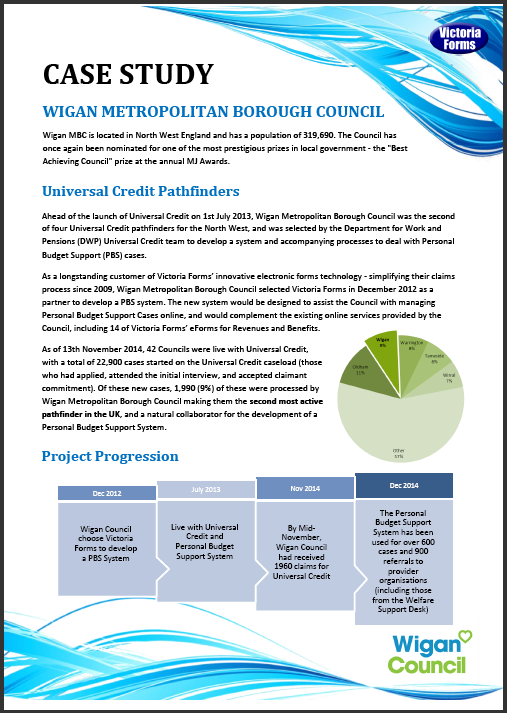 Wigan were the second of four Universal Credit pathfinders for the North West, tasked with finding the best way to handle Personal Budget Support (PBS) cases. 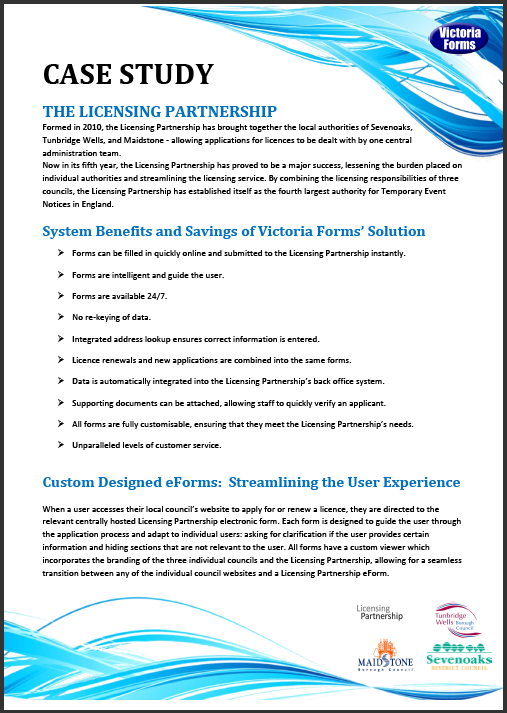 Victoria Forms developed a PBS system tailored to managing cases and referrals easily, which complements the existing Victoria Forms eForms system. 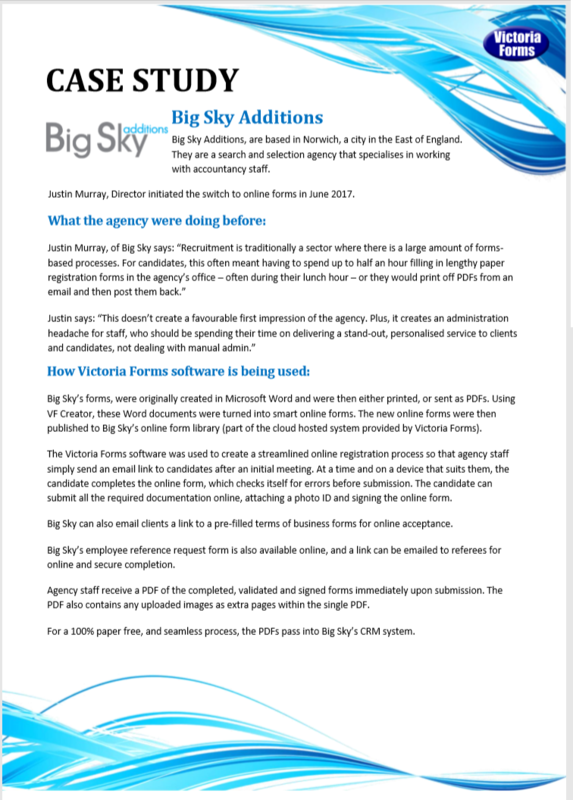 Switching to online forms has significantly reduced Big Sky Additions’ administration burden and made the process of registering new candidates much faster… As a company it has become more efficient and technology-driven in the eyes of our candidates, clients and staff.